People living in or visiting San Francisco love to use the quote misattributed to Mark Twain that compares summer weather in San Francisco to winter anywhere else. While the quote is over-used and not always reflective of the actual weather, it does bear an unfortunate truth on many of the summer days of the week that end in ‘y.’ There are many San Francisco summer days that require one to leave the city for it to truly feel like a traditional June, July or August afternoon. Luckily, there are a lot of destinations with warmer climates just an hour or two away. Although most of the spots are great for a long weekend, or even a week (more vacation days please! ), a day trip is a great option when you need some instant gativacation, and of course in California, you can still get a sunburn, and trick people into thinking you had a much longer vacay. One of the most relaxing and beautiful of the San Francisco day trip destinations is Napa, or just about any part of the Northern California Wine Country. In Napa, the average July high is in the low-80s; a much better showing than the average San Francisco high of just 68. On a good day with no traffic, you can even get there in about 60 minutes, making it the perfect spot to get away and enjoy a true summer afternoon. There are so many wineries, you almost don’t need to plan ahead, although some do require an advance reservation. You will want to plan a general route but as most of the wineries are pretty concentrated, the day is yours for the taking! 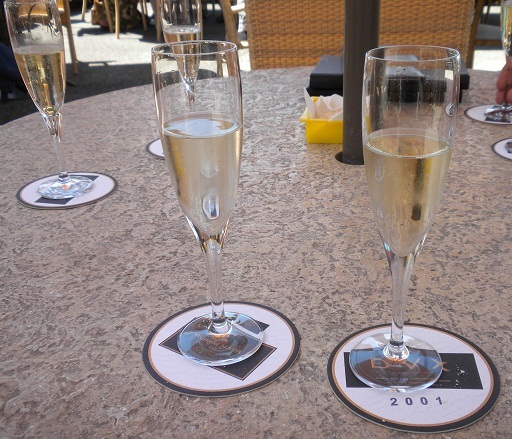 If you love sparkling wine and who doesn’t), check out Mumm. They offer full pours and the beautiful scenery will make the beverages that much better. If you are an SF Giants fan, you’ll have to try the Mumm Napa Brut Prestige; it’s the beverage the team used to celebrate their 2010 World Series win! For an impressive variety, try the V. Sattui winery. For 10 dollars you get to select six tastes from a very expansive selection. The hosts are very gracious and can help you pinpoint exactly which six you are most likely to enjoy. Napa and St. Helena are great spots for picnicking and there are several cute markets and delis where you can pick up cheese and other snacks to enjoy. Some of the wineries have picnic areas, but most require that you purchase at least some, if not all, of your consumables on-site. Try Crane Park for a picnic: With lots of tables, a bocce ball court and even bathrooms, you’ll have just about everything you need. Plan your exit strategy. Because most of the wineries close around the same time (between 4 and 6), the main roads can get really crowded and leaving can be an exercise in patience. Look for Groupons! In recent weeks, there have been a ton of offers for limo services that can take you and your besties from San Franciso to wine country. Then you get to arrive (and depart) in style, and no one has to take on the unpopular, but very necessary, duty of the designated driver. Now what are you waiting for? Summer doesn’t last forever! Let us know your favo rite Napa secrets in the comments! Mumm Napa - the best! I found that getting off the beaten path away from the more well known there are a lot of tremendously great winerys. One very memorable was in an actual cave. I will have to say that one of my all time favorites is Geyser Peak. Thanks for the tip! We are looking forward to taking advantage of a few Napa caves the next time we make it to wine country. Getting off the beaten path definitely yields a lot of great finds!